Staining of human peripheral blood granulocytes with Mouse anti Human macrophages (MCA874EL) following permeabilization with Leucoperm (BUF09). Mouse anti Human macrophages antibody, clone MAC387 used for the identification of canine macrophages in canine skin by immunohistochemistry on formalin fixed, paraffin embedded tissue sections. 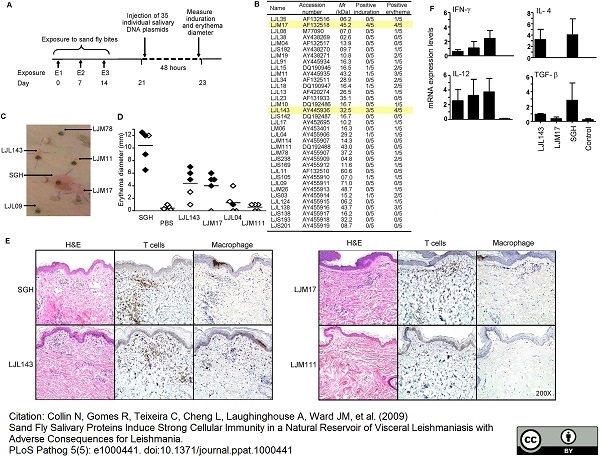 Dogs develop a strong humoral and cellular immune response to bites of Lu. longipalpis sand flies. Dogs (n = 9) were exposed for 10 min to bites of 20 sand flies three times at one week intervals (first exposure, E1; second exposure, E2; third exposure, E3). (A) Weekly measurement of IgG, IgG1 and IgG2 antibody levels in dogs exposed to sand flies. (B) Induration score in a representative dog 48 h after each of three sand fly exposures. The induration score is an arbitrary scale corresponding to the area of induration and redness resulting from multiple bites where 1≤1 cm2, 2≤5 cm2, 3≤10 cm2 and 4>10 cm2. (C) Representative H&E staining of biopsies taken from sand fly bite sites prior to exposure (E0) and 48 h after each of three sand fly exposures (E1–E3). Note marked cellular infiltrate within dermis and thickening of epidermis in E3. (D) Immunohistochemical labeling of tissue sections from E3 demonstrating the presence of abundant CD3+T cells (CD3), macrophages (Mac387) and eosinophil granules (Luna stain). Sand Fly Salivary Proteins Induce Strong Cellular Immunity in a Natural Reservoir of Visceral Leishmaniasis with Adverse Consequences for Leishmania. Mouse anti Human macrophages antibody, clone MAC387 used for the identification of macrophages in canine skin by immunohistochemistry on formalin fixed, paraffin embedded tissue sections. Identification of salivary proteins from Lu. longipalpis that produce a cellular immune response in dogs. (A) A schematic representation of the reverse antigen screening approach based on the intradermal injection of DNA plasmids in dogs previously exposed to sand fly bites (first exposure, E1; second exposure, E2; third exposure, E3). (B–F) Dogs pre-exposed to sand fly bites were challenged intradermally with DNA plasmids and one pair of salivary gland homogenate (SGH) and PBS (positive and negative controls, respectively) and investigated 48 h post-injection. (B) The number of dogs showing local induration and/or erythema at the site of injection for 35 DNA plasmids coding for secreted salivary molecules. Yellow bars highlight the response of dogs to LJM17 and LJL143. (C) Photograph to demonstrate specificity of the cellular reaction to DNA plasmids and SGH. (D) The diameter of erythema in the absence (◇) or presence (◆) of induration for each dog at the site of injection of SGH, PBS, LJL143 and LJM17 (reactive plasmids) and LJL04 and LJM111 (intermediate and non-reactive plasmids, respectively). (E–F) Skin biopsies (6mm) obtained from injection sites were cut in half and processed for histology and RNA extraction. (E) Representative H&E staining and immunohistochemical labeling of dermal T cells (anti-CD3) and macrophages (Mac387) at the injection sites of SGH, LJL143, LJM17 and LJM111. 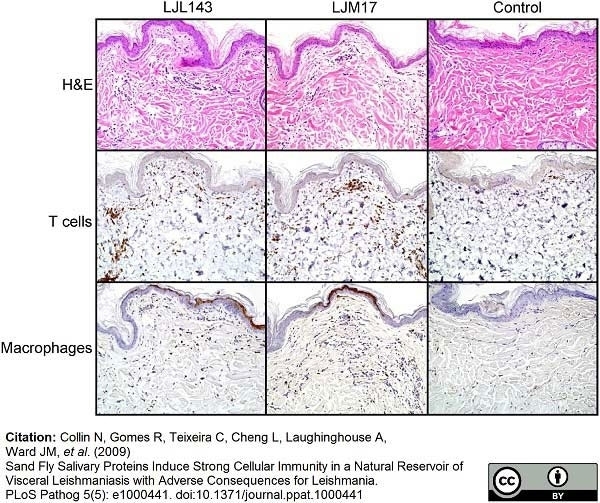 Note marked dermal infiltrates of inflammatory cells characterized as CD3+ T cells and scattered macrophages (Mac387) in the SGH, LJL143 and LJM17. There is no inflammation with LJM111. (F) Reverse-transcriptase quantitative PCR showing the expression levels of IFN-γ, IL-12, IL-4 and TGF-β for LJL143, LJM17, a pair of SGH and control (a mix of PBS and empty plasmid) 48 h post-injection. Error bars represent means±S.E. 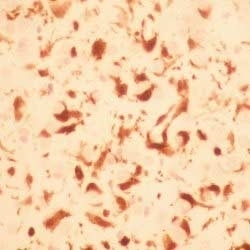 Mouse anti Human macrophages antibody, clone MAC387 (MCA874G) used for the identification of macrophages in canine skin by immunohistochemistry on formalin fixed, paraffin embedded tissue sections. Sand fly salivary recombinant proteins produce a DTH response in dogs previously exposed to sand flies. (A) Purity of the recombinant salivary proteins produced by HEK-293F mammalian cells and purified by a HPLC nickel trap column. (B) The diameter of erythema in the absence (◇) or presence (◆) of induration for each dog at the site of injection 48 h after challenge with salivary gland homogenate (SGH), PBS, recombinant proteins rLJL143 and rLJM17 (reactive), rLJM111 (non-reactive) and a non-related tick recombinant protein TB179. (C) Representative H&E staining and immunohistochemical labeling of T cells (anti-CD3) and macrophages (Mac387) at the injection sites of rLJL143, rLJM17 and rLJM111. Note marked dermal infiltrates of inflammatory cells characterized as CD3+ T cells and scattered macrophages (Mac387) with rLJL143 and rLJM17; rLJM111 is negative. Bites of Lu. longipalpis sand flies induce a strong focal and systemic adaptive cellular immune response in dogs immunized with LJL143 or LJM17. (A–C) Dogs were exposed to uninfected and infected sand flies for 10 min one month after the final immunization with either LJM17, LJL143 or the empty plasmid (control). (A–C) Skin biopsies (6mm) obtained from bite sites 48 h post challenge with 20 and five uninfected and 10 infected sand flies were cut in half and processed for histology and RNA extraction. 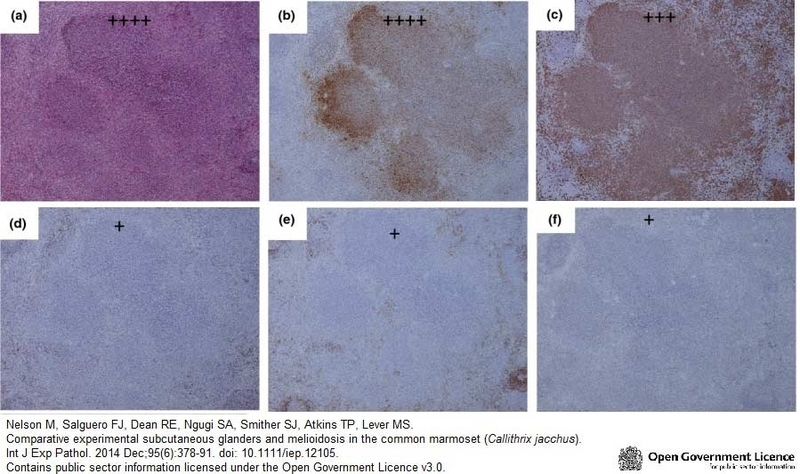 (A) Representative H&E staining and immunohistochemical labeling of T cells (anti-CD3) and macrophages (Mac387) at the bite sites of 20 uninfected sand flies in LJL143- and LJM17-immunized and control dogs. (B) Reverse-transcriptase quantitative PCR showing the expression levels of IFN-γ, IL-12, IL-4 and TGF-β at the bite sites of 20 or five uninfected sand flies in LJL143- and LJM17-immunized and control dogs (for control dogs RNA was combined from sites of 20 and 5 uninfected sand fly bites). (C) Same as (B) using 10 infected sand flies. Histological sections from bite sites of five uninfected and 10 infected sand flies are provided as Figure S1 and Figure S2, respectively. (D–E) PBMC from LJL143- and LJM17-immunized and control dogs obtained one week after exposure to sand flies. (D) Frequency and mean fluorescence intensity (MFI) of CD3+ T cells following stimulation with medium, rLJL143 or rLJM17. (E) Frequency of CD4+ and CD8+ T cells expressing IFN-γ in PBMC from LJL143- and LJM17-immunized dogs. Error bars represent means±S.E. * P<0.05, ** P<0.01. From: Collin N, Gomes R, Teixeira C, Cheng L, Laughinghouse A, et al. (2009) Sand Fly Salivary Proteins Induce Strong Cellular Immunity in a Natural Reservoir of Visceral Leishmaniasis with Adverse Consequences for Leishmania. Bites of Lu. longipalpis sand flies induce a strong focal cellular immune response in dogs immunized with LJL143 or LJM17. Dogs were exposed to 5 uninfected sand flies for 10 min one month after the final immunization with either LJM17, LJL143 or empty plasmid (control). Skin biopsies (6mm) obtained from bite sites 48 h post challenge were processed for histology. 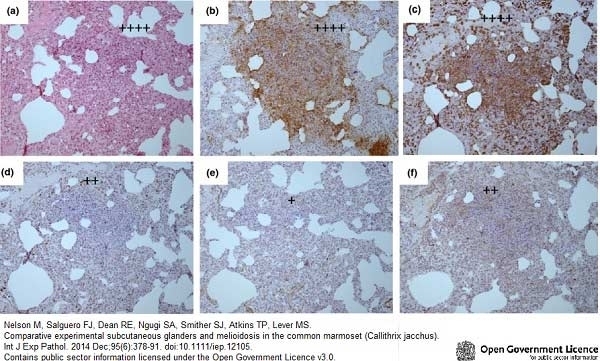 Representative H&E staining and immunohistochemical labeling of T cells (anti-CD3) and macrophages (Mac387) at the bite sites in LJL143- and LJM17-immunized and control dogs. 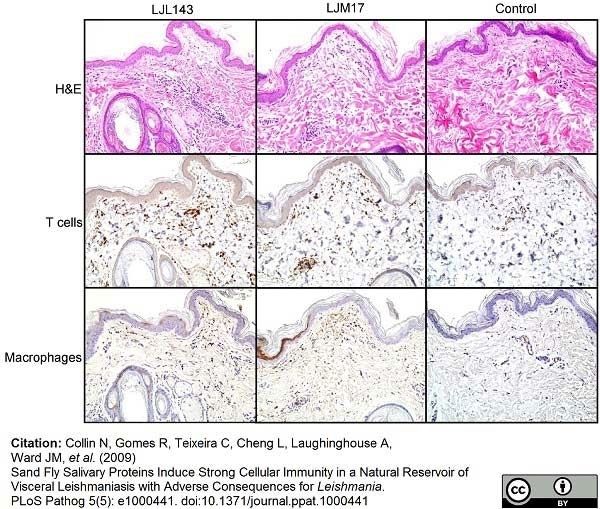 Bites of L. i. chagasi infected sand flies induce a strong focal cellular immune response in dogs immunized with LJL143 or LJM17. Dogs were exposed to ten L. i. chagasi infected sand flies for 10 min one month after the final immunization with either LJM17, LJL143 or empty plasmid (control). Skin biopsies (6mm) obtained from bite sites 48 h post challenge were processed for histology. 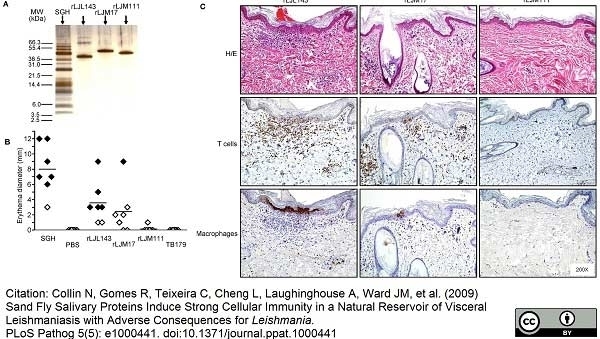 Representative H&E staining and immunohistochemical labeling of T cells (anti-CD3) and macrophages (Mac387) at the bite sites in LJL143- and LJM17-immunized and control dogs. From: Collin N, Gomes R, Teixeira C, Cheng L, Laughinghouse A, et al. (2009) Sand Fly Salivary Proteins Induce Strong Cellular Immunity in a Natural Reservoir of Visceral Leishmaniasis with Adverse Consequences for Leishmania. Mouse anti Human macrophage antibody, clone MAC387 used for the detection of macrophages in rabbit skin by immunohistochemistry on formalin fixed, paraffin embedded tissue sections. A photomontage of wounds and microscopic changes occurring within 24 hours after surgery. When ATP-vesicles are used, granulation starts to appear within 12 hours (A), and H&E staining indicates a rich cellular component (B). Granulation tissue growth continues and covers the whole wound at 24 hours (C). Granulation tissue shows positive anti-MAC387 staining (D), which is further confirmed by CD163 staining (inset) (E). PCNA staining indicates very active proliferation of these cells (F), which is further confirmed by BrdU antibody staining (inset). Wounds treated with Regranex do not display this rapid growth. 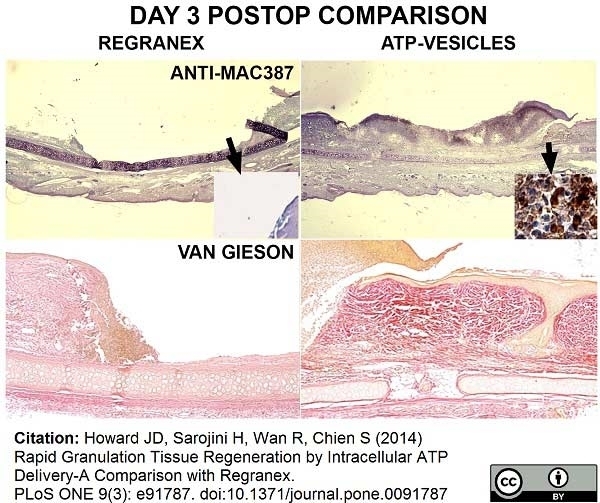 Rapid Granulation Tissue Regeneration by Intracellular ATP Delivery-A Comparison with Regranex. Macrophage accumulation in early days. 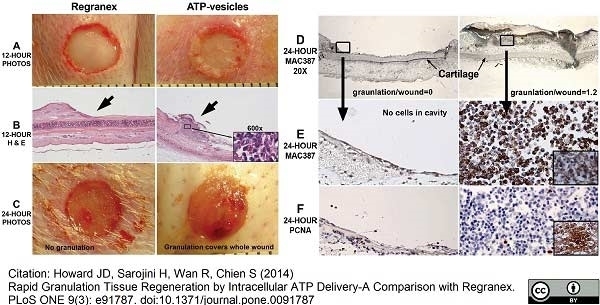 When the wounds are treated with ATP-vesicles, solid granulation occurs at day 3 (B). The growth is filled with macrophages, which occur not only in wound cavity, but also underneath the ear cartilage (D). The wounds treated with Regranex do not have similar growth (A, C). 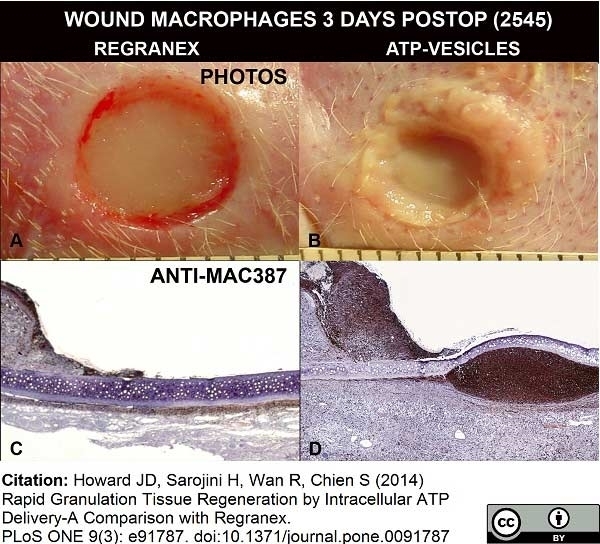 Comparison of Regranex and ATP-vesicle treated wounds 3 days postoperatively. Rich collections of macrophages are stained dark brown to black by Anti-Mac387 (top panels), and more collagen is shown by van Gieson stain (low panels) in the wounds treated with ATP-vesicles. Regranex treated wounds do not show a similar effect. Mouse antiHuman macrophages antibody, clone MAC387 used for the demonstration of lesion associated macrophages in Burkholderia pseudomallei infected marmosets by immunohistochemistry on formalin fixed, paraffin embedded tissue sections. Representative H&E and IHC stained tissue sections from the spleen of a marmoset humanely euthanised at 48 h p.c. challenged with 1.85 × 102 ± 57 cfu of Burkholderia pseudomallei by the subcutaneous route. (a) H & E showing multifocal lesion with severe necrosis (++++), (b) Burkholderia pseudomallei antigen IHC showing abundant bacteria associated with the lesion (++++), (c) IHC staining showing a moderate number of macrophages associated with the lesion (+++), (d) IHC staining showing very few T cells associated with the lesion (+), (e) IHC staining showing very few B cells associated with the lesion (+), (f) IHC staining showing very few inducible Nitric oxide synthase (iNOS) producing cells associated with the lesion (+). From: Nelson M, Salguero FJ, Dean RE, Ngugi SA, Smither SJ, Atkins TP, Lever MS. Comparative experimental subcutaneous glanders and melioidosis in the common marmoset (Callithrix jacchus). Int J Exp Pathol. 2014 Dec;95(6):378-91. Representative H&E and IHC stained tissue sections from the inoculation site of a marmoset humanely euthanised at 36 h p.c. challenged with 1.85 × 102 ± 57 cfu of Burkholderia pseudomallei by the subcutaneous route. (a) H & E showing multifocal lesion with severe necrosis (++++), (b) B. pseudomallei antigen IHC showing abundant bacteria associated with the lesion (++++), (c) IHC staining showing a small number of macrophages associated with the lesion (++), (d) IHC staining showing very few T cells associated with the lesion (+), (e) IHC staining showing no B cells associated with the lesion, (f) IHC staining showing very few inducible Nitric oxide synthase (iNOS) producing cells associated with the lesion (+). Representative H&E and IHC stained tissue sections from the liver of a marmoset humanely euthanised at 144 h p.c. challenged with 1.79 × 102 ± 20 cfu of Burkholderia mallei by the subcutaneous route. (a) H & E showing non-necrotic multifocal solid lesions (++), (b) Burkholderia mallei antigen IHC showing a small number of bacteria associated with the lesion (++), (c) IHC staining showing a small number macrophages associated with the lesion (++), (d) IHC staining showing very few T cells associated with the lesion (+), (e) IHC staining showing no B cells associated with the lesion, (f) IHC staining showing a small number inducible Nitric oxide synthase (iNOS) producing cells associated with the lesion (++). Representative H&E and IHC stained tissue sections from the lungs of a marmoset humanely euthanised at 144 h p.c. challenged with 1.79 × 102 ± 20 cfu of Burkholderia mallei by the subcutaneous route. (a) H & E showing multifocal lesion with severe necrosis (++++), (b) B. mallei antigen IHC showing abundant bacteria associated with the lesion (++++), (c) IHC staining showing abundant macrophages associated with the lesion (++++), (d) IHC staining showing a small number of T cells associated with the lesion (++), (e) IHC staining showing very few B cells associated with the lesion (+), (f) IHC staining showing a small number inducible Nitric oxide synthase (iNOS) producing cells associated with the lesion (++). Mouse anti Human macrophages, clone MAC387 recognizes the L1 or Calprotectin molecule, an intracytoplasmic antigen comprised of a 12 kDa alpha chain and a 14 kDa beta chain. Although originally described as binding to epitopes common to both the alpha and beta chains (Flavell et al. 1987) subsequent studies indicate that the antibody detects an epitope exclusively expressed on the beta chain (Goebeler et al. 1994) demonstrated by immunofluorescent and western blotting on both naturally expressing and transfected targets. In addition Mouse anti Human macrophages, clone MAC387 detects the beta chain in complex with the alpha. The antigen recognized by Mouse anti Human macrophages, clone MAC387 is expressed by granulocytes, monocytes and by tissue macrophages. Variable results have been reported for staining brain macrophages and microglia. The epitope recognized appears to be well conserved and the antibody is routinely used for the detection of myeloid cells in a wide range of species. 2This product requires protein digestion pre-treatment of paraffin sections e.g. trypsin or pronase. Flavell, D.J. et al. (1987) Identification of tissue histiocytes on paraffin sections by a new monoclonal antibody. J Histochem Cytochem. 35 (11): 1217-26. Brandtzaeg, P. et al. (1988) Mac 387 antibody and detection of formalin resistant myelomonocytic L1 antigen. J Clin Pathol. 41 (9): 963-70. Brandtzaeg, P. et al. (1992) The leucocyte protein L1 (calprotectin): usefulness as an immunohistochemical marker antigen and putative biological function. Ramsay, A.D. et al. (1991) Phenotypic analysis of malignant lymphoma in simian immunodeficiency virus infection using anti-human antibodies. J Pathol. 164 (4): 321-8. Christgau, M. et al. (1998) Characterization of immunocompetent cells in the diseased canine periodontium. J Histochem Cytochem. 46 (12): 1443-54. Pérez, J. et al. (1999) Immunohistochemical study of the inflammatory infiltrate associated with equine squamous cell carcinoma. J Comp Pathol. 121 (4): 385-97. Obert, L.A. & Hoover, E.A. (2002) Early pathogenesis of transmucosal feline immunodeficiency virus infection. J Virol. 76 (12): 6311-22. Malik, N. et al. (1998) Apoptosis and cell proliferation after porcine coronary angioplasty. Bagavant, H. et al. (2002) Induction and immunohistology of autoimmune ovarian disease in cynomolgus macaques (Macaca fascicularis). Am J Pathol. 160 (1): 141-9. Vranckx, K. et al. (2012) Vaccination reduces macrophage infiltration in bronchus-associated lymphoid tissue in pigs infected with a highly virulent Mycoplasma hyopneumoniae strain. BMC Vet Res. 8: 24. García-Jiménez, W.L. 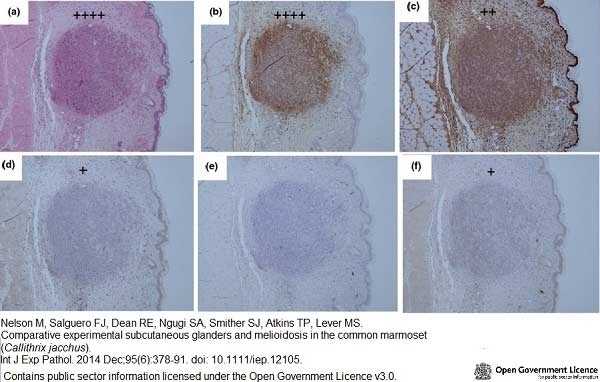 (2012) Histological and immunohistochemical characterisation of Mycobacterium bovis induced granulomas in naturally infected fallow deer (Dama dama). Vet Immunol Immunopathol. 149: 66-75. Carrade, D.D. et al. (2012) Comparative Analysis of the Immunomodulatory Properties of Equine Adult-Derived Mesenchymal Stem Cells. Cell Med. 4 (1): 1-11. Masure, D. et al. (2013) A Role for Eosinophils in the Intestinal Immunity against Infective Ascaris suum Larvae. PLoS Negl Trop Dis. 2013 Mar;7(3): e2138. Tellez, A. et al. (2014) Experimental evaluation of efficacy and healing response of everolimus-eluting stents in the familial hypercholesterolemic swine model: a comparative study of bioabsorbable versus durable polymer stent platforms. Coron Artery Dis. 25 (3): 198-207. Collin, N. et al. 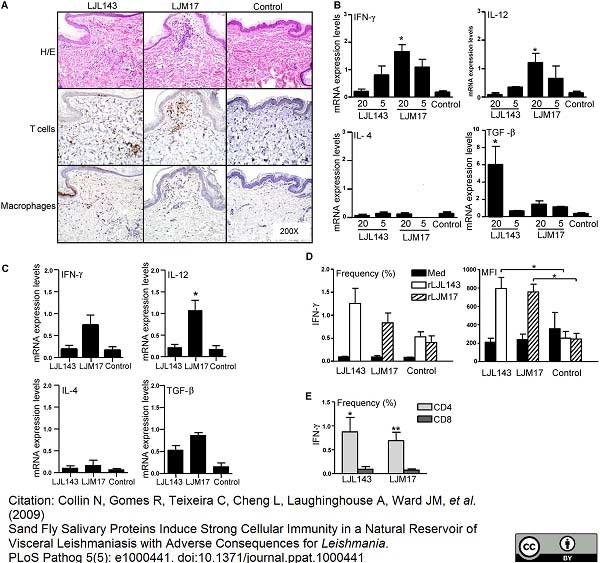 (2009) Sand fly salivary proteins induce strong cellular immunity in a natural reservoir of visceral leishmaniasis with adverse consequences for Leishmania. McCurdy, P. et al. (2014) Acute lymphoblastic leukemia in a pygmy hippopotamus (Hexaprotodon liberiensis). J Zoo Wildl Med. 45 (4): 906-10. Marcaccini, A. et al. (2008) Pseudorabies virus infection in mink: a host-specific pathogenesis. Vet Immunol Immunopathol. 124 (3-4): 264-73. Romero-Palomo, F. et al. (2015) Immunopathologic Changes in the Thymus of Calves Pre-infected with BVDV and Challenged with BHV-1. Rossi, C.N. et al. (2016) In situ Cutaneous cellular immune response in dogs naturally infected by visceral leishmaniasis. Rev Inst Med Trop Sao Paulo. 58: . Vrolyk V et al. (2016) Lung Inflammation Associated With Clinical Acute Necrotizing Pancreatitis in Dogs. Nelson, M. et al. (2014) Comparative experimental subcutaneous glanders and melioidosis in the common marmoset (Callithrix jacchus). Int J Exp Pathol. 95 (6): 378-91. Amarilla, S.P. et al. (2016) Thymic depletion of lymphocytes is associated with the virulence of PRRSV-1 strains. García-Jiménez, W.L. et al. (2013) Immunopathology of granulomas produced by Mycobacterium bovis in naturally infected wild boar. Vet Immunol Immunopathol. 156 (1-2): 54-63. Pilling, D. et al. (2015) The long pentraxin PTX3 promotes fibrocyte differentiation. PLoS One. 10 (3): e0119709. Santana, C.H. et al. (2016) Relationship Between the Inflammatory Infiltrate and the Degree of Differentiation of the Canine Cutaneous Cell Carcinoma. Isling, L.K. et al. (2010) Pyelonephritis in slaughter pigs and sows: morphological characterization and aspects of pathogenesis and aetiology. Acta Vet Scand. 52: 48. Burk, J. et al. (2013) Equine cellular therapy--from stall to bench to bedside? Cytometry A. 83 (1): 103-13.